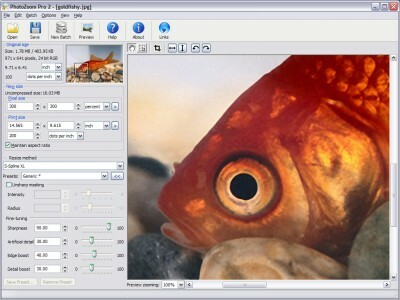 BenVista PhotoZoom Pro 3 is software for enlarging digital images, available for OS X 10.4+ and Windows. It is based on S-Spline Max: the latest generation of BenVista's patented, award-winning S-Spline interpolation technology. S-Spline Max is specialized in creating sharp, crisp clear, and true to nature image enlargements, perfectly preserving edges, details, and shapes. PhotoZoom Pro 3 is world's number one image enlargement solution. PhotoZoom Pro 3 is world's number one image enlargement solution, and an absolute must-have for both professionals and serious amateurs who want to resize their images.Functions & Features:Patented, award-winning S-Spline technologies, including the brand new S-Spline Max techniqueHigher quality image enlargements & higher quality downsizingWorks as a stand-alone application, and as an Automation plug-in and Export plug-in for PhotoshopMulti-processor support: huge speed increase! PhotoZoom Pro is able to render image magnifications without the serrated edges. Qweas is providing links to PhotoZoom Pro 3.1.0 as a courtesy, and makes no representations regarding PhotoZoom Pro or any other applications or any information related thereto. Any questions, complaints or claims regarding this application PhotoZoom Pro 3.1.0 must be directed to the appropriate software vendor. You may click the publisher link of PhotoZoom Pro on the top of this page to get more details about the vendor.